Former judge Dursun Ali Gündoğdu and prosecutors Adnan Çimen and Sadrettin Sarıkaya, who had overseen an investigation into the Iran-backed Tevhid-Selam network in Turkey until they were dismissed in 2014, were arrested on Monday. The jurists, who were detained on Friday, testified from İstanbul via videoconference to a court in Ankara, which handed down the arrest decision for “coup plotting” and “membership in a terrorist organization,” in reference to the Gülen movement, which is labeled a terrorist organization by the Turkish government. Detention warrants had been issued for Gündoğdu, Çimen and Sarıkaya over their alleged links to the faith-based Gülen movement, which Turkish authorities accuse of being behind a failed coup attempt in Turkey last July. 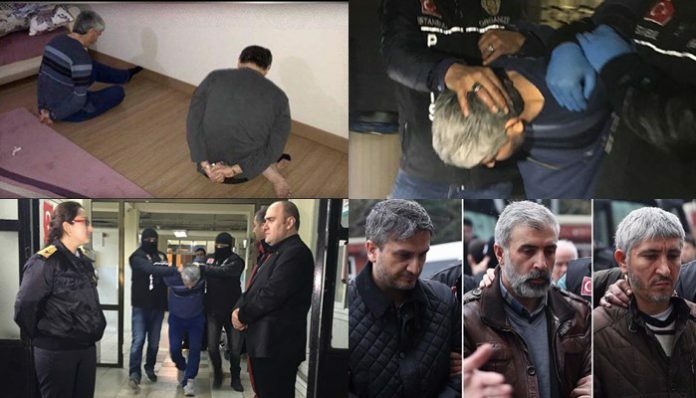 Police raided two apartments in the Kayaşehir neighborhood of Istanbul on Friday and detained the three former members of the judiciary. As part of an investigation carried out by Bakırköy Deputy Public Prosecutor Ömer Faruk Aydıner, Gündoğdu, Çimen and Sarıkaya were accused of political and military spying, attempting to overthrow government of the Turkish Republic, revealing top secret state documents, fabricating crimes, forgery in official documents and professional misconduct. The investigation into the Tevhid-Selam network, an Iran-backed clandestine organization which has long been nested in Turkish government organizations with extensions in the media, business world and nongovernmental organizations, was first launched in 2010 after Kamile Yazıcıoğlu, a 49-year-old woman who had fled from her abusive husband, informed Bursa’s anti-terror unit that her husband, Hüseyin Avni Yazıcıoğlu, has been working for Iranian intelligence and provided documents as evidence to back up her claims. According to documents obtained by prosecutors during the investigation, the Tevhid-Selam network was linked to the Tevhid magazine and the Selam newspaper and had been involved in several unsolved murders in Turkey, including those of intellectuals such as Bahriye Üçok, Muammer Aksoy, Abdi İpekçi, Ahmet Kışlalı and Uğur Mumcu. Following the purges in the Turkish judiciary soon after the revelation of a graft scandal in December 2013 in which ministers from the ruling Justice and Development Party (AKP) and figures close to President Recep Tayyip Erdoğan was implicated, the AKP government stifled the Tevhid-Selam probe and abruptly replaced the prosecutors on the case. While the new prosecutors decided on non-prosecution, the former judge and prosecutors in the case, Gündoğdu, Çimen and Sarıkaya, were dismissed. In the meantime, a massive smear campaign was launched in the media to discredit the probe as government officials rushed to downplay the significance of the evidence gathered over three years. While the AKP government accused the Gülen movement of being behind the graft probe in December 2013, the government crackdown on the movement speeded up following the failed coup on July 15 of last year as Erdoğan pinned the blame on the Gülen movement. In a currently ongoing post-coup purge, over 135,000 people, including thousands within the military, have been purged due to their real or alleged connection to the Gülen movement, according to a statement by the labor minister on Jan. 10. As of Feb. 1, 89,775 people were being held without charge, with an additional 43,885 in pre-trial detention.